This handcrafted necklace consists of faceted rhombs and smooth round Peridots in the exquisite AAA quality. They’re said to radiate in the most luscious green known to man. A beautiful and uniquely shaped long Biwa Pearl flanked by two braided Gold vermeil sculptures is the eye catcher of this composition. This feature gives the necklace a unique twist to be able to be worn either with the Pearl sideways or classic in the centre of your chest. It is a cultured Pearl from the Biwa Lake in Japan. At the ends there are two more Gold vermeil spheres ending in the high quality golden Clasp. Gold vermeil is solid Sterling Silver covered with a substantial layer of 24K Gold. Peridot is a lush green semi-precious stone that is the birthstone of August. A Peridot doesn't get darker at night, consequently the Romans named it The Evening Emerald. Did you know, the ancient Egyptians used it as currency and it was more valuable than Diamonds? It is said that Cleopatra's favourite precious stone was actually not an Emerald but a Peridot. Peridot is supposed to increase fidelity and love and is a symbol for truthfulness and friendship. Peridot is said to be good for you if you want to become famous or successful in any way. It belongs to the Olivine mineral family only found in deep volcanic sediments and especially in Meteors. The lustrous beauty of the Pearl has been cherished since the dawn of mankind. According to the ancient Greek belief, Jewellery with a Pearl is capable of promoting marital bliss and eliminate emotional imbalances. The technique to enhance Pearl forming in shells and oysters has been used since the year 1893. A little object or tissue of a donor shell is implanted into the shell and around it forms a protective layer by layer and eventually a Pearl is formed. Cultured pearls can then be harvested in a very sustainable way in harmony with nature. The Pearl is a symbol of faithfulness integrity and wisdom. It is also said to have calming qualities, too. The Pearl is the birthstone for the ones born in June. The necklace is 42.5 cm long. The Biwa Pearl is 11 mm long and 5.5 mm wide. The facetted Peridot rhombs are 6.3mm long, 4.9mm wide and 25 mm thick. The Peridot spheres measure 4 mm in diameter. Each individual link of this lavish Gold necklace has been handcrafted into unique circles. Luxuriously sized and extraordinarily cut faceted Amethys.. These are made to order 9ct Gold ear studs each featuring a princess cut square Peridot in top AAA quality. Peridot is a lush green semi-precious sto.. This triple necklace features a stunning free-form Pearl on chains made of Pearls and Gold, made to order for you. These freshwater Pearls have outst..
A wide solid Sterling Silver ring, on which a hand carved Frog with a crown and a freshwater Pearl, sits. The frog was hand carved in wax and through..
Each circular link of this solid 9 carat yellow Gold necklace has been crafted individually and linked by hand. The six onion-shaped Moss Aquamarines.. This handcrafted necklace is made of Golden Rutilated Quartz and solid Sterling Silver. Its individually shaped free-form elements show a notably cle.. Lavish short necklace or collier made of beautifully smooth Amber and special white freshwater Biwa pearls, all of which a.. This necklace features distinctive freeform shaded Citrines with clear, yet smooth edges. Two wonderful Amethysts complement the pastel col..
A beautiful natural oval Emerald is embeded in this solid Sterling Silver ring. The look and feel of this ring is rich in variety to the se..
For this necklace I cast a vertebrae bone of a mink from an old collection in Sterling Silver. I love natural shapes and I couldn’t h.. 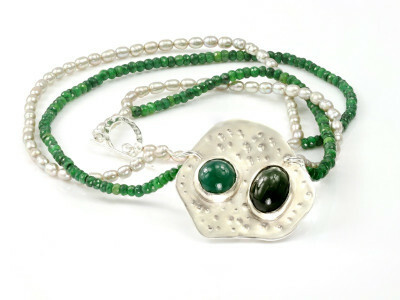 This is a unique double necklace made of elegant facetted Emeralds and genuine freshwater Pearls. It features a handcrafted wrought pendant..
A translation from the formation of a gemstone. Inspired by the geology of gemstones I tried to replicate an Aquamarine Crystal Matrix. This ensemble ..
White Freshwater Pearls in the superior AAA quality make up this elegant necklace, it has been hand knotted using a natural silk cord.Th.. This exclusive necklace consists of Mandarin Garnet rondells in the exquisite AAA quality.Each link of this rare gemstone has been facet..